The Bucharest Biennale International Advisory Board met in Timișoara and awarded the curatorship for the 9th Bucharest Biennale unanimously to Henk Slager (NL). With its innovative model refined throughout the previous eight editions, the Bucharest Biennale is now regarded as one of the most vital biennials in Europe, holding a widely respected position within the international art scene. For BB9, curator Henk Slager is interested in evaluating—the dominance of—the concept of research and its related trends of thought in the contemporary art world. To this end he will—in collaboration with a number of decisive research centers—develop a constructive contribution to the re-thinking of the current artistic research discourse. Moreover, consideration will be given to finding a suitable, topical form of presentation. Related to this, attention will be paid to the role and significance of biennials as platforms for the production and circulation of ideas. 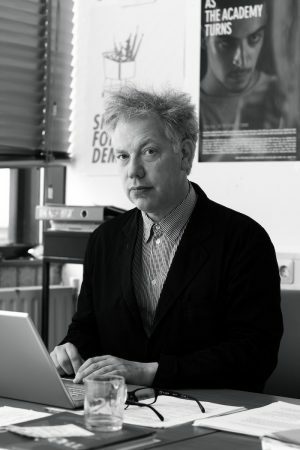 As Professor of Artistic Research (Finnish Academy of Fine Art 2010-2015, HKU University of the Arts Utrecht 2006- ) Henk Slager has made significant contributions to the debate on the role of research in visual art. In 2004, Henk Slager – together with Jan Kaila and Gertrud Sandqvist – initiated the European Artistic Research Network (EARN), a network that investigates the impacts of artistic research on current art education through symposia, expert meetings, and presentations. Departing from a similar focus on artistic research, he also (co-)produced various curatorial projects, e.g. Freedom, What was that all about, Kuandu Biennale 2018; To Seminar, BAK Utrecht 2017; Timely Meditations, 5th Guangzhou Triennial 2015; Experimentality, 1st Research Pavilion, Venice 2015; Aesthetic Jam, Project Taipei Biennial 2014; Offside Effect, 1st Tbilisi Triennial 2012; Doing Research, curatorial project for dOCUMENTA (13) 2012; As the Academy Turns, Collaborative project Murcia, Manifesta 8, 2010; Nameless Science, Apex Art, New York 2009; and Translocalmotion, 7th Shanghai Biennale 2008. In 2015 he published The Pleasure of Research, an overview of educational and curatorial research projects. The 9th BUCHAREST BIENNALE (Bucharest International Biennial for Contemporary Art), generated by Pavilion – journal for politics & culture – is set for May 28 – July 4, 2020, under the curatorship of Henk Slager (NL).